Pylypets, private house "At Igor’s and Victoria’s"
Rest in Pylypets in the private house. There are double rooms and a bathroom for 3 rooms. It is about 1500 m to the lift; there is a store in 150 m. There is Wi-Fi, meal and a summer house as well. Private house "At Igor’s and Victoria’s"
Private house "At Igor’s and Victoria’s" is located in Pylypets village of Zakarpattia oblast in Ukraine. This house is located near a river and a forest. It is about 1500 m to the nearest lift. It is about 150 m to the store as well. You can rent the second floor of the two-storey building. On the floor there are 3 double rooms, a bathroom and a hall with a sofa and bar. The owners of the house live on the first floor. Cold and hot water is 24 hours and as well as the autonomous heating. There is a summer house and a place for parking. There is a bridge to the river just from the territory and from there you can go to the forest. • bathroom for 3 rooms (shower, toilet, wash basin, towel rail, hairdryer). Meal in the private house "At Igor’s and Victoria’s" is provided. Price per accommodation in Pylypets at the private house "At Igor’s and Victoria’s" you have to specify by the contact telephone numbers. • if you travel by car, you choose the highway Kyiv-Chop. 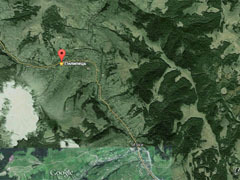 In Nyzhni Vorota village you have to turn towards Volovets and then to Mizhhiria. On the left side of the road there is a sign of the private house "At Igor’s and Victoria’s". • Private house "At Igor’s and Victoria’s"
We invite you to rest at the private house "At Igor’s and Victoria’s"! 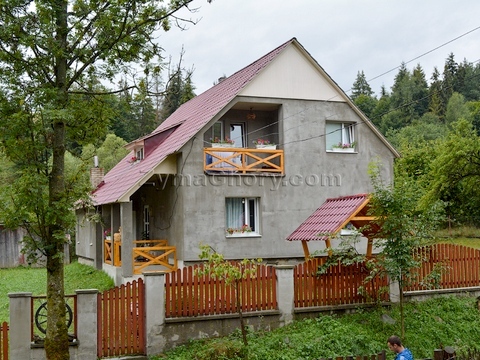 2015 - 2017, rest in Carpathians, hotel "Igor and Victoria"
Bathroom for 3 rooms Bathroom for 3 rooms: shower cubicle, WC pan, washbasin, hairdryer. Standard 2-bed room "Standard": double bed, TV, wardrobe, table, bathroom for 3 rooms. Standard 2-bed room "Standard": double bed, TV, table, chest of drawers, bathroom for 3 rooms. Standard 2-bed room "Standard": double bed, TV, table, bathroom for 3 rooms.